After waiting for couple of months, finally I got my Mac Mini! The configuration is 1.42 GHz, 80 GB harddrive, combo CD-RW/DVD, airport extreme and bluetooth. All together comes with around $870. I know it's more expensive than the list price in Apple site, but hei, I don't live in US! First impression: the box is so cute. It looks really small in the picture, and it is really small. The size is almost the same with my first external CD writer. Switched it on, Apple logo appears, spent some time to fill the registration and username, and get fully functional OS X panther. Performance: acceptable. It's definitely not mini. I didn't upgrade the memory so it's still 256 MB. But it's enough for home user applications. 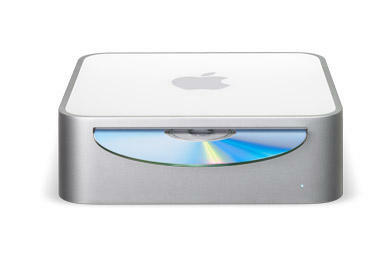 The best part from Mac Mini: it's so cute and very quite. The first thing I did, obviously, was installing Firefox. Then enabled SSH, Apple file sharing, firewall, and started transferring my music collection to it. The purpose is clear: to make it as entertainment center. Unfortunately my kid and my wife love it too and decided not to allow me to do funny staff on it. My Mac Mini now is under their custody. Well, I have to wait until they get bored. But at least I'm glad they don't have to deal with Window$ ever again. Thank you Steve Jobs, to make all of this possible.